The government of Japan announced the country’s departure from the International Whaling Commission (IWC) in December 2018, along with its intention to resume commercial whaling—which the IWC has forbidden since 1986—within its own coastal waters. The international reaction to this news began with condemnation, but Japan’s move has at least the virtue of good faith. If whaling is going to happen—and it will, at least for the foreseeable future—it may be better that it takes place honestly than under the false flag of science. Japan previously stayed within the IWC by taking advantage of an exception that allowed whaling for scientific research. Many conservationists, legal scholars, and some governments viewed this as a sham, a thinly veiled commercial whaling operation conducted under the banner of science. 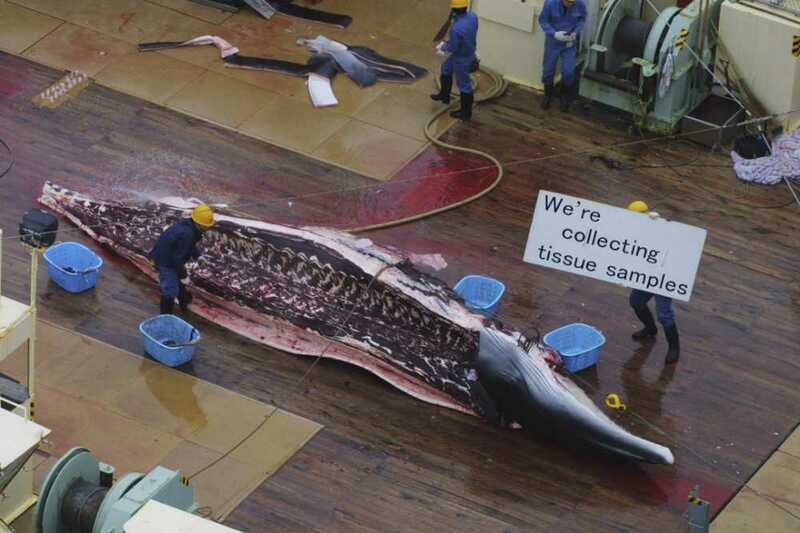 Sometimes this “banner” was a literal one: Japanese whaling ships were painted with the word RESEARCH (in English) in bold, capital letters along their hulls, and crewmembers were sometimes photographed holding signs with statements such as “We’re collecting tissue samples” next to whale carcasses being flensed by their colleagues on deck. These statements, along with the piles of reports presented by Japan’s Institute of Cetacean Research, failed to convince many in the international community that Japan’s “scientific” whaling activities were being conducted in good faith. World War II had the twin effects of enforcing a worldwide pause in whaling and the near-complete devastation of Japan’s economy. Gen. Douglas MacArthur, the leader of the postwar American occupation, actively promoted a resumption and increase of Japanese whaling in order to address the shortages of both food and economic activity there. While this controversial policy decision pitted MacArthur against other elements of the U.S. government and those of other allied nations, it was embraced within Japan, where whaling was essentially reinvented and modernized following the war. Japan acceded to IWC membership soon after the commission came into being, joining in 1951. For at least the first two decades of its existence, the dominant philosophy within the IWC was the belief that the whaling industry had to be protected by conserving the whale populations it targeted. During the 1970s, though, membership in the organization—which is open to any sovereign state—began to increasingly include nonwhaling nations. This change, according to legal historian Harry N. Scheiber, was coordinated “apparently for the specific purpose of changing the balance of votes and thus to institute a moratorium policy.” In 1982, the “balance of votes” was sufficient to pass a total moratorium on commercial whaling. This moratorium took effect in 1986 and has been upheld at every subsequent IWC meeting. Commercial whaling by nations in the commission has been banned for 33 years. But despite the supposed ban, legal whaling remains possible—if not common. As an international organization based upon voluntary membership, the IWC has no authority to compel adherence to its policies by non-member states. Countries that have never joined the commission are not bound by its rules. Those such as Canada, Egypt, Greece, the Philippines, Venezuela—and now Japan—that once were members but have since left are equally free to whale. None of these countries is currently discussing commercial whaling operations—except, of course, Japan—but Japan’s departure from the commission specifically in order to pursue commercial whaling ventures is not without precedent. Iceland left the IWC in 1993 over the commission’s refusal to reconsider the moratorium, only to rejoin in 2002. In addition to commercial whaling occurring outside of IWC oversight, it also may be practiced by IWC members that have lodged official objections to the moratorium. Per Article V in the original convention that established the commission, objecting member states are not held to standards contained within amendments to which they have objected. Iceland and Norway currently host commercial whaling operations under this proviso. Speaking at a recent whaling symposium in Japan, I was upbraided for referring to the objection clause as a “loophole”; some Japanese whaling researchers quickly reminded me that it’s a legitimate part of the IWC framework, built in to guard against the very kind of departure that Japan has now made. Additionally, IWC member states may host other kinds of whaling operations besides those considered commercial: aboriginal subsistence whaling, operations targeting species not explicitly protected by the commission (mainly smaller toothed whales and dolphins, collectively referred to as small cetaceans), and scientific permit whaling—the last of which provided Japan’s previous excuses. But that’s all over now. Japan’s recent announcement not only ends its membership in the IWC, and with that its scientific permit whaling operations in the Antarctic and North Pacific, but it also eliminates any international obstacles toward the establishment of an openly commercial whaling operation within Japan’s exclusive economic zone. This move will limit Japanese whaling, both spatially and in terms of species targeted. It will promote the recovery of depleted and vulnerable whale populations, especially those found in the Southern Ocean Whale Sanctuary. And it will be legal: As a non-member state of the IWC, Japan is free to whale within its own coastal waters. Whaling outside of the Japanese exclusive economic zone, in contrast, would run afoul of the United Nations Convention on the Law of the Sea, which requires that signatory states “work through the appropriate international organizations for [the] conservation, management and study” of cetaceans on the high seas. Most U.N. member states consider the IWC to be the only “appropriate international organization” for such management. Multiple conservation organizations and governments alike viewed Japan’s departure from the IWC as a step toward a future of unregulated Japanese whaling. It’s certainly true that when a nation chooses to support and regulate whaling unilaterally, rather than through established channels for cooperation, the strength and influence of those international channels are weakened. The IWC is a weaker organization without Japan’s membership. After some consideration, though, conservation organizations began to see a silver lining in the storm clouds that gathered over the IWC’s headquarters in Cambridge, England, following Japan’s departure. The Animal Welfare Institute, the Sea Shepherd Conservation Society, and Jean-Michel Cousteau’s Ocean Futures Society, among others, expressed optimism that the restriction of Japanese whaling activities to Japanese coastal waters would allow some of the more vulnerable whale populations in the North Pacific and the Southern Ocean to recover. For Japan to drop its “scientific research” cover, to call commercial whaling by its name, and to confine the activity to its own waters is, arguably, less bad than continuing with a business-as-usual, IWC-approved scientific whaling program in international waters. Yes, the scope of the commission’s influence is reduced as a result of Japan’s departure. But this is hardly the first time that its competence has been called into question. What will Japan’s move mean for whales? That depends on several factors, including the effect it has on other IWC member states that may be contemplating their own departure, the size and scope of Japan’s soon-to-be-established coastal commercial whaling operation, and the future balance of influence between international organizations like the IWC, which is decidedly anti-whaling even when that policy stance contradicts the advice of its own scientific committee, and regional ones such as the North Atlantic Marine Mammal Commission that are structured to allow for some degree of regulated whaling. In the end, a whale does not care whether it’s harpooned by a Norwegian whaler acting in objection to the IWC’s moratorium, an Inupiaq aboriginal subsistence whaler, or a Japanese commercial whaler. Any form of whaling necessarily affects individual whales, but not all whaling affects whale populations equally. Because some whaling is likely to continue in one form or another for the foreseeable future, the best possible scenario going forward is one that heavily promotes international cooperation, science-based policies, and good-faith honesty in calling things what they are. Japan’s departure from the IWC and its establishment of an openly commercial whaling operation in its own coastal waters at least meets one of these criteria.